Allan Showalter, who runs the popular 1HeckofaGuy Cohen fan site, recently interviewed me about the book. The discussion follows. You are the editor of a collection of interviews with Leonard Cohen. Who are the readers you had in mind when you put together Leonard Cohen on Leonard Cohen? Serious fans who want to know more about the man behind the music will likely constitute the primary audience for Leonard Cohen on Leonard Cohen; I don’t expect that someone with just a passing interest will be likely to spend 600+ pages with his thoughts. But more people are becoming devoted fans every day and for them, this chronologically arranged collection should offer lots of insights and surprises and a chance to examine Cohen’s entire adult life as it unfolds through his own words. How did you choose the specific interviews that comprise the book? Did you have any formal criteria? Do the articles that ended up in the book have any common characteristics? While I had no formal criteria, I did make an effort to include material from as many years as possible. I also looked for interviews that shed new light; some repetition was inevitable—people tend to repeat stories, jokes and observations—but I tried to include conversations that showed some aspect of Cohen you couldn’t quite find elsewhere. I should add that I had no shortage of material to choose from. I passed on using dozens of Q&As and I was being approached about including interviews even after I’d finished the book. The description of the book on your website has it that “approximately 25 percent of the material has not previously been printed anywhere. 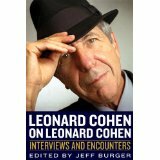 A few of the print pieces have not previously been published in English and some of the material has not previously been available in any format, including the many reflections and reminiscences that contributors supplied specifically for this project.” I know that previously unavailable content will be of special interest to fans who may have already read many interviews with and articles about Cohen. Can you tell us about this material that is available for the first time in English and, especially, the material that is available for the first time in any format in Leonard Cohen on Leonard Cohen? Among the most important “first time” pieces are the many radio and TV interviews from the CBC, Vin Scelsa and other sources that have never previously been printed. The Paris interview with Stina Lundberg Dabrowski was aired in part and a partial transcript appeared online but Stina sent me the raw footage, which included much more. Also, singer/songwriter Suzanne Vega contributed a memorable foreword to the book and, as noted above, many of the interviews are preceded with fresh insights and recollections that the interviewers supplied specifically for this project. What are the important themes that recur in these pieces? Did you detect any concepts or beliefs espoused by Leonard Cohen in the interviews that changed over time? Are there instances in which he contradicted himself? Are there issues that he consistently tried to avoid? There are many important recurring themes. To cite just one: Cohen’s sense that everything is falling apart. Much does change through time, including his willingness to talk about his bouts with depression, which is one of several subjects he avoids early on. Contradictions abound: he discusses his romantic involvements with assorted movie and pop stars but repeatedly emphasizes that he is not the ladies’ man he’s often said to be; he insists he’s not depressed but eventually talks in detail about his depression and lists all the antidepressants he’s tried; and while he takes obvious and well-deserved pride in his poetry and lyrics, he claims that he’s a minor poet and suggests that his poems are mere “jokes.” As I point out in the preface, there’s also the fact that he once said he dislikes talking but seems in many of these interviews to thrive on conversation. You interviewed many of the interviewers. What insights did you gather from them? My standard line for years has been that Leonard Cohen gives good interview—and often, especially in the video interviews, it appears he does so regardless of the skills of the person asking the question. How important is the interviewer to a Leonard Cohen interview? I agree that he gives consistently good interviews. But I think his most illuminating ones are with people to whom he feels some connection—people who ask the most perceptive questions and with whom he establishes a true dialogue. It also helps if he’s interested in the interviewer’s life. Occasionally in such cases, he turns things around and starts interviewing the interviewer. From your own reading of these interviews, which is your favorite? Why? I have several favorites, including the ones with Paul Zollo (more substantive talk about Cohen’s songwriting than you’ll find just about anywhere else), the ones with Stina Lundberg Dabrowski (they have an obvious rapport and the conversations are revealing) and Jian Ghomeshi (ditto). Of all those Leonard Cohen quotes, which did you find the most surprising? Probably the ones in his conversation with Richard Guilliatt, where an apparently inebriated and unhappy Cohen seems to be looking for a one-night stand. Perhaps when he tells Dabrowski that while women have loved him over the years, he was “unable to reply to their love…I couldn’t reach across the table for it. I couldn’t reach across the bed.” Judging by his failure to establish a relationship that has stood the test of time, this is apparently true. And sad. There are quite a few candidates for this title. To pick one, almost at random, there’s his explanation to Paul Zollo of the line, “The maestro says it’s Mozart but it sounds like bubblegum.” He understands that “every generation revises the game and decides on what is poetry,” so there are no absolutes, and that has helped to open him to everything from rock to rap. How would you characterize Leonard Cohen’s interview style(s) and what he was trying to accomplish in interviews? Did his style and intent change from interview to interview or over the years? As I point out in the preface, his style does indeed appear to change over the years. Early on, he is often sarcastic, cynical or playful—and certainly less than fully candid. He talks a lot about religion, politics, philosophy and the world condition but says relatively little about his personal life or failings. That comes later, when he discards what he himself refers to as his “cover story” and opens up about his depression and other subjects. Carolyn Oliver interviewed me about the book for her blog, Rosemary and Reading Glasses. That discussion follows. Would you tell us a little about how you selected the interviews included in Leonard Cohen on Leonard Cohen? With difficulty. Though the Zen Buddhists called Cohen “Jikan,” meaning “the silent one,” he sure gave lots of interviews. I included about 50 and was being offered new ones even after I wrapped up this project. I tried to incorporate material that covered as many years and as much fresh turf as possible. I didn’t reject interviews that have been published before if they contained important insights—I saw value in having as many good conversations as possible all in one place, in chronological order—but I did give some priority to rare and previously unavailable material. Readers may know that you are an often-published music journalist. How did your preparation for this project differ from your approach to review and interview projects? This was completely different. For interviews and certainly for reviews and commentaries, you rely largely on your own imagination and views; this project required a bit less creativity on my part and a lot more research. Finding the material was part one; then of course, I had to secure permission to use it, which wasn’t always easy with regard to pieces that appeared decades ago in long-defunct publications. A lot of detective work was involved but it was satisfying to wake up in the morning and find an email from a writer I’d been trying to locate for months. How long did it take to put together this collection? Was the process similar to the one you undertook for Springsteen on Springsteen, which you also edited? It took me the better part of a year, working virtually every night and much of every weekend. (I have an understanding family.) Yes, it was quite similar to the process with Springsteen on Springsteen, which was helpful: I learned a lot from doing that book, and what I learned made this one much easier than it otherwise would have been. Before you started work on Leonard Cohen on Leonard Cohen, did you have a favorite Leonard Cohen song, or book, for that matter? If so, did you learn anything surprising about that favorite song or work? I’ve been a fan of Cohen’s music since college and have a bunch of favorite songs, ranging from early classics like “So Long, Marianne” and “Famous Blue Raincoat” to “Hallelujah,” “In My Secret Life,” “Tower of Song” and the recent “Going Home.” I already knew a fair amount about these particular songs but I learned all sorts of surprising facts about Cohen from these interviews. For me, though, the most interesting thing was simply to observe how his thoughts, circumstances and personality evolved slowly over five decades. After reading all these interviews, is there a question or question that you’d like to ask Leonard Cohen yourself? I could probably formulate a few if the opportunity presented itself, but nothing immediately comes to mind. As noted above, Cohen has been interviewed extensively over many years, and the answers to just about anything I might want to ask are already in my book. What’s next on your writing and editing horizon? I have a full-time job running a magazine and, on the side, I do a little writing on music and other subjects, mostly these days for TheMortonReport.com, NoDepression.com and my own website, byjeffburger.com. As for another book, I may well put together a third musician interview collection but not immediately. I need to take a break and spend some time with my family.